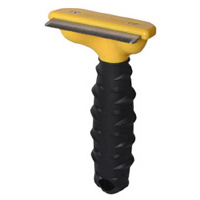 Furminator De Shedding Grooming Tool reduces shedding by removing up to 90 percent of your dog's loose unwanted hair and dead undercoat without damaging the top coat. The furminator dog de-shedding tool has a stainless steel blade that works by gently grasping and removing loose undercoat hair from your dog, reducing unwanted shedding in the home. Simply use the furminator once or twice a week for about 10-20 minutes and you will see a noticeable difference around your home, leaving you with the simple task of cleaning up the dog hair you have removed, rather than spending hours every week trying to remove unwanted pet hair from carpets, sofas, clothes and furnishings around the home. Please note the furminator is NOT suitable for non-shedding breeds or pets with skin conditions. 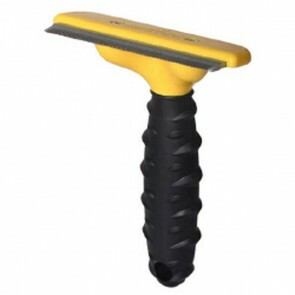 We only sell genuine furminators not copies! Furminator: 5 stars out of 5 based on 2 user reviews.